2013 Lexus GS Pros and Cons: Why (Not) This Car? From the start, Lexus nailed the needs and wants of luxury sedan buyers. But they're not content with this group. They also want to sell cars to people who love driving. But, in the intramural midsize sedan contest, the Camry-based ES outsold the driver-oriented GS by more than ten to one in 2011 (40,873 vs. 3,746 cars). Still, Lexus refused to give up, and last year introduced a redesigned 2013 GS. Is the fourth time the charm? Brick red seats aren't to everyone's taste, but they are to mine. Why the 2013 Lexus GS? The 2013 Lexus GS 350 has so many things done right that it's not easy to pick the thing done best. After some consideration, I'm going with the highly-adjustable driver seat included in both the F Sport and Luxury Packages. Some seats are supportive in aggressive driving. Some are comfortable. Few are both. These are among the few. Adjustments with either package include bi-level lumbar (enabling a broader, better-fitting shape than the more common vertically-adjustable lumbar bulge), thigh support, and side bolsters (the latter no longer offered by BMW on the 5-Series). The Luxury Package adds the same adjustments on the passenger side, upper seat back adjusters, and richer leather. The harder, less adjustable, less form-fitting seats in the 5-Series are neither as supportive nor nearly as comfortable. When equipped with V8s, the last two generations of GS were quick cars. But if your definition of fun-to-drive included corners, they fell short. The new GS handles much better. Even in F Sport form feedback through the steering wheel and seat is not as nuanced as in the BMW, but body motions are more tightly controlled (especially with the adaptive dampers set to Sport+). Moderately firm steering weights up nicely and the tight, fluid responses of the chassis simply feel right. I found the BMW easier to drive quickly along a challenging road, but I more enjoyed driving the Lexus. All of the tested cars were fitted with all-wheel-drive. A rear-wheel-drive GS 350 F Sport, which has more performance-oriented tires and active steering, should be even more fun. With all-wheel-drive, you get some understeer and can't much affect the chassis with the throttle. With a slightly floaty suspension the regular GS is less fun than the F Sport, but still better than people expect from Lexus. More closely resembles a BMW 5-Series from this angle. The instrument panel swells to include a 12.3-inch display. A V8 is no longer available in the GS. And unlike the sixes in competing Audis and BMWs, that in the GS 350 is not turbocharged. Personally, I still prefer natural aspiration. There's much less midrange grunt without a turbo, but wind the GS 350's 3.5-liter V6 past 4,000 rpm and it comes alive with a zing and a purity of sound you just don't get with a turbine spinning in the exhaust flow. A "sound symposer" pipes choice notes to the cockpit, deepening and enhancing the engine's already sweet song. The automatic is a six-speed (carried over like the engine) rather than the newer 8-speed box in the LS and 2014 IS. But it partners very well with the engine, usually finding the ideal ratio promptly and smoothly without your explicit input. Lexus has been seeking a distinctive design language about as long as they've been seeking to out-handle BMW. The first-generation GS remains the most attractive, but the newest one is a major improvement over the previous two. Edges and curves come together to provide a more aggressive look than you'll get from today's post-Bangle BMWs. If you seek hints of Japanese culture, you'll find them. The new "spindle grille", inspired by Toyota's origins as a loom manufacturer, has been highly controversial. I don't love it, but (unlike most reviewers) I don't dislike it. It is unquestionably distinctive. With its 19-inch rims and bolder face, the F-Sport looks leaner and meaner than the regular GS. Silver paint pairs especially well with the wheels' titanium finish. Even the F Sport variant of the GS retains the silky, well-insulated character that has distinguished rear-wheel-drive Lexus sedans since the groundbreaking original LS. Going down the road the car feels smoother, quieter, more refined, and simply more "premium" than the BMW 5-Series. Especially in the F Sport you'll feel and hear bumps, but impacts are never harsh. I never wished for a more pillowy ride. Some sedans handle better, and others ride better, but very few do both better than the new GS 350 F Sport. Why Not the 2013 Lexus GS? In casual suburban driving the trip computer reported between 22 and 23 mpg, splitting the difference between the EPA ratings of 19 city and 26 highway. When I made the engine sing mpg dropped into the high teens. Slip into Eco and drive the GS like a Prius, and 25 is barely doable. Not bad for a 306-horsepower, two-ton, all-wheel-drive sedan. But the torquier Audi A6 3.0T and BMW 535i xDrive do a little better, especially on the highway. The Teuton's turbos help a little here, but most of the blame/credit goes to their respective transmissions. If and when Lexus fits the GS AWD with the eight-speed automatic already offered in the RWD car, it'll likely catch up. Overall, I like the look of Lexus's latest interiors, with their strong horizontal themes and sporty detailing. But a couple of details inside the new GS rubbed me the wrong way. Styled to include a very large, 12.3-inch display screen without a bulge, the instrument panel appears massive. The top surface of said panel is partially upholstered in an odd pattern that pads only the areas farthest from the people in the front seats, with white stitching that attaches to--what, the molded IP?--and that looks a little cheap. You'll find none of these details inside the upcoming 2014 IS 350 F Sport--they're learning. Easily the GS's most controversial angle. Lower fascia is tamer with the non-F car. Roomier and more comfortable than in the previous GS. Those are the only cons I can come up with. The tested cars stickered in the high 50s even without some pricey options. But a four-cylinder 528i equipped like the tested F Sport costs $6,000 more before adjusting for feature differences, $4,000 more afterwards. Add another $4,000 for the 535i. So compared to its target, the new GS 350 F Sport is reasonably priced while providing both more luxury and more driving enjoyment. Buyers also seem to be finding few reasons not to buy--sales are way up. The cover isn't as extensive as on some Lexus, but you still can't see the engine. Phil Coron of Meade Lexus in Southfield, MI, provided the Lexus GS 350 F Sport. He can be reached at 248-372-7100. Lexus provided a GS 350 Luxury with insurance and a tank of gas. 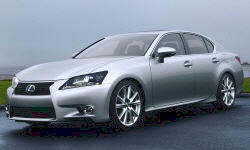 2013 Lexus GS pros and cons, according to Michael Karesh: the best reasons for buying (or not buying) the 2013 Lexus GS. Join TrueDelta to post your own impressions.